With daily wear, your engagement ring can get dirty and lose some of its sparkle. Fortunately, all it takes is a little time and right products to return your ring to its original beauty. Keep these tips in mind to clean your ring safely and effectively. Before you begin cleaning your ring, you need to be aware of the materials used in its construction. This is important to avoid damaging your jewelry. Take a look at your ring and think about the following factors. If you have a diamond engagement ring, take a minute to learn how to clean diamonds. Although they are extremely durable, it's still important to properly care for these precious gems. If the ring has treated diamonds, you may need to use specialized cleaning techniques to avoid inadvertently discoloring the gems. If you know your diamonds are treated, ask your jeweler for recommendations based on your specific gem. If you have a non-diamond engagement ring, you'll need to consider the gem. Many very soft gems like pearls and turquoise require extra-gentle, chemical-free cleaning. Other gems like sapphires and rubies are nearly as durable as diamonds. If you're in doubt about the materials in your jewelry or the care those materials require, consult a jeweler before you attempt to clean your ring. It's also important to check your ring for damage before you begin cleaning it. If your ring has any loose stones, cracks, warped prongs, or missing details, cleaning can aggravate the damage. It is best to have a professional jeweler repair your engagement ring to avoid creating bigger problems. If you'll be cleaning in the bathroom or kitchen, be sure to plug the sink tightly or install a small wire mesh strainer to avoid mishaps with open drains and narrow pipes. Line your work surface with a soft towel in a color that contrasts with your jewelry. That way, if you drop your ring, you'll be able to see it easily. The towel will keep it from bouncing off the counter and getting lost on the floor. Weiman Jewelry Cleaner - Weiman makes a wide range of precious metal cleaning supplies and has been in business since 1941. Their jewelry polish has received four stars by Amazon users and retails for under five dollars. It is safe on most gems, but the company specifies that it should not be used for opals, turquoise, pearls, and other soft materials. Connoisseurs Jewelry Cleaner - The self-stated world leader in jewelry cleaning solutions, Connoisseurs is another excellent choice. This jewelry cleaner also received four stars from Amazon users, and it retails for about seven dollars. Although it is safe for most gems and precious metals, this product shouldn't be used on delicate materials. You can also make your own jewelry cleaner at home. 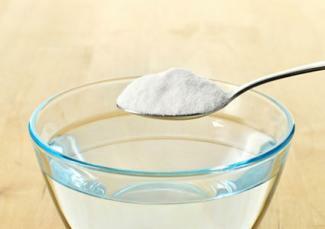 Good Housekeeping recommends between one and two tablespoons of baking soda dissolved in a cup of hot water. Certain cleaning products can actually damage your jewelry, and so should be avoided. Many jewelers, such as Brilliance.com, advise against using ultrasonic jewelry cleaners. These can cause gems to loosen in their settings, and they may even cause some diamond flaws to worsen. Avoid abrasive cleaners, such as toothpaste. While these may remove dirt and grime, they will also scratch your precious metal jewelry. Skip any homemade or purchased cleaning solutions that include harsh chemicals like bleach, ammonia, acetone, and rubbing alcohol. When you start the cleaning process, it's a good idea to soak the ring in the cleaning solution for two or three minutes to loosen caked on debris and dissolve oily residue. This allows the cleaning solution to penetrate through the grime and makes the dirt easier to remove. 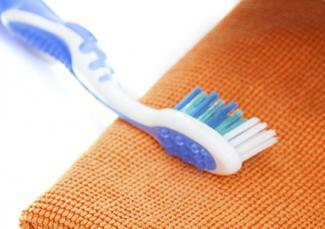 Use a soft bristle brush, such as a toothbrush for sensitive teeth, to loosen stuck-on dirt and grime. This also helps you get into the crevices on a ring. 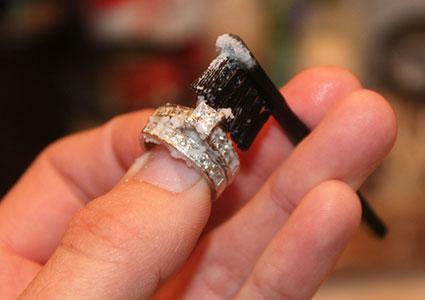 Scrub the ring gently from all angles with the brush. Pay special attention to the sides and underside of the gem, since these areas can be difficult to reach and tend to accumulate a lot of dirt. If you allow any of the jewelry cleaner to remain on the ring, it may create residue spots when it dries. Rinsing your ring well will help avoid this. You can submerge your ring in warm water, but running water is the best way to thoroughly rinse your jewelry. Simply hold your ring securely in a stream of water, making sure you plug the drain of the sink before you begin. Do not use tissues or paper towels to dry your ring. These items have rough fibers that can leave lint and dust on the ring. The lint may scratch delicate gems or metals. Instead, dry the ring carefully with a lint-free polishing cloth or jewelry cloth. If desired, you can also use a hair dryer to air dry the ring quickly so no water spots remain. In most situations, you can clean your ring at home. However, it's a good idea to have your jewelry professionally cleaned at least once per year. At the same time, your jeweler can inspect the settings and make sure all gems are secure. If your ring contains very delicate materials like pearls or opals, professional cleaning is usually your best option. This way, you can make sure your ring stays beautiful and that the precious gems don't get damaged. Between cleanings, you can use a lint-free cloth to polish your ring. This can actually help remove some of the residue from hand lotions and other products, so you won't need to clean your ring as often. It's a good idea to make this part of your daily routine. Despite the best care, all rings need cleaning from time to time. If you lead an active lifestyle or are newly engaged and like to show off your engagement ring, you may want to clean it weekly or even every few days. Otherwise, a monthly cleaning should suffice, as well as cleaning the ring before special occasions to be sure it looks its best. With proper cleaning, your ring will look brand new, even decades after your wedding.